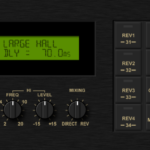 The Roland SDE-1000 Digital Delay is a high quality digital delay machine with various attractive features including chorus. Highly Accurate Delay Time Display (10.1 ms step indication from 0 to 10mB). Memory function retaining up to four different panel settings. Modulation Fool Control and Preset Shift Jacks useful for live performance. Play Mate Jack that enables delay time setting with the Foot Control. The Hold Jack ollows delay sound repetition. Delay Remote Jack that is useful for turning the Delay effect on or off. The Twin Output jacks useful for stereo performance such as Chorus effect. The Roland SDE-1000 Digital Delay uses a 12bit system with a less than CD sampling rate, which yields a lower frequency response than CD and is part of the reason for the sonic signature of the delayed signal.